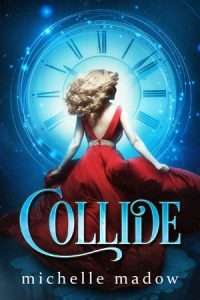 Collide is a MUST READ for fans of Before I Fall and If I Stay. Don’t miss this gripping, fast paced romantic thriller with a unique fantasy twist! I should have died when I was shot at the Halloween dance. But first I need to convince someone—anyone—that I’m telling the truth… and then get them to help me. Decades ago, the Demon King Ezekiel conquered Mexico City and cursed it with greed. The only way to end the curse? An angel needs to slay Ezekiel with Uriel’s Flaming Sword. But Ezekiel has stolen the Sword and hidden it in his Watchtower — the gleaming skyscraper where he lives and rules. Now the angel Rebekah has been chosen to enter the city, find the Sword, and kill the demon. When Ezekiel opens auditions for women to live in the Watchtower as his concubines, it’s the perfect opportunity for Rebekah to get close to the devilishly handsome demon king, locate the Sword, and use it to end the curse. Except that while Rebekah’s in the city, she’ll be cursed with greed, like everyone else. She must conquer her greed and complete her mission. But that’s harder than it sounds when she discovers there’s one thing she craves above all else… love from the Demon King himself. 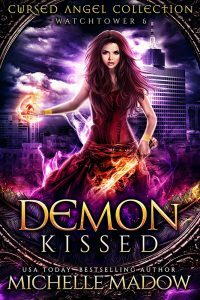 Demon Kissed is THE perfect book for fans of The Hunger Games and Supernatural! Demon Kissed is a standalone contribution to the Charmed Legacy: Cursed Angel Watchtowers collection. Stories can be read in any order.